Scott Westerfeld writes YA — that is, books for “young adults” as the term is used in publishing today. That officially means ages 12 through 18; but in fact it means anyone smart enough to read it, however young. Or, for that matter, however old. You know perfectly well that lots of adults read YA. If it’s a good book, it’s a good book. Westerfeld writes the YA that I wish existed back when I was in middle school. So, I’m reading them now, to make up for the previous lack. 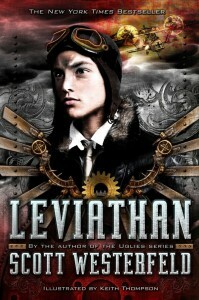 I’m especially fond of the Leviathan trilogy (Leviathan, Goliath, Behemoth), a steampunk/bio-hacking-punk alternate universe series with the coolest tech and really engaging characters. I listened to it in the audiobook versions during workouts at the gym, which I highly recommend as inspiration for sticking to your exercise plan: get a great audiobook that you only allow yourself to listen to at the gym. More than once I kept pushing on, just to reach the end of the chapter. (I did the same with Ellen & Delia’s The Fall of the Kings, actually.) Of course, the audiobook versions didn’t have the excellent illustrations by Keith Thompson in the printed books. In fact, there’s a boxed set that would be perfect for the young reader on your list. And you know that cliche about how boys don’t read? Well, we know different, of course — but if you happen to have reluctant young male readers on your list, Leviathan might be just the thing to lead them into the wider reading world. Another good one for that: Westerfeld’s Peeps. And yet another good one for that, but with less of an SF/F slant: So Yesterday. I haven’t read his latest yet (Afterworlds), but it sounds perfect for that voracious reader who also wants to be a writer. And don’t miss Westerfeld’s blog, which is full of writing advice.